Last time I wrote a 'why don't you try this' post I think I scared a few people by suggesting they cut into treasured yardage, so this month, to redress the balance, I've been thinking about scraps. We've all got them and the popularity of RSC and Oh Scrap suggests that we all want to reduce them, yet we go on hoarding the tiniest of pieces then worrying about how we should use them. So why not use them for your improv? Now, I know the idea of scrappy improv is not a new one: flick around the web and you can find plenty of examples of crumb blocks and 'made' fabric, sometimes used to give a modern twist in traditional designs, sometimes put together in a less structured way. You can sew together your scraps into strip sets and use those as the basis for something, grab a handful of scraps every time you start a quilt and work them in as you go along, use them for specific scrappy elements in a design, work small or sort through what you have and employ your bits in a clearly defined colour scheme. The possibilities are virtually limitless. However you go about it, a mix of fabrics can make a quilt interesting to look at, drawing the eye from one detail to the next, creating moments of surprise for us to discover and enjoy. What's more, the challenge of making something coherent from a mishmash of bits, instead of using a well planned selection of yardage, teaches us a lot about the use of colour, placement, value, all that technical quilty stuff that makes such a difference to a successful piece. Alternatively you could just make a dog. Labels: AHIQ, improv, Scraps, Why don't you try this? Oh I have been working since 2011 trying to use up scraps. 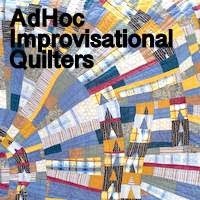 They have now become my favorite quilts. You are so right the way the fabrics play off of each other really makes your eye move from block to block. I picked a bouquet of flowers in my flower garden one day and was admiring how the more variety I added the more I like the bouquet. A light bulb went off, and that is when I stopped worrying about the right shade of fabric to go into a quilt. Now quilting is a whole lot more fun! Wait, you are supposed to make something coherent? I have been using my scraps for the 365 circles but I do think this year, I am going to take the leftover scrap and put it into a scrap quilt. Love your dog! Cute dog! Scraps also make good doll clothes and art quilts. Oh Kaja you gave me the great experience of laughing out loud for several minute with that dog. I even shared it with my husband. So cute. I really love the yellow quilt above it. your Lego quilt is sort of similar to the Scrap Vortex - both lovely for scraps. Love your doggie! Your Lego blocks make such a good scrap quilt. I like the shorter bits sewed together. Cute puppy. Does he have a name? 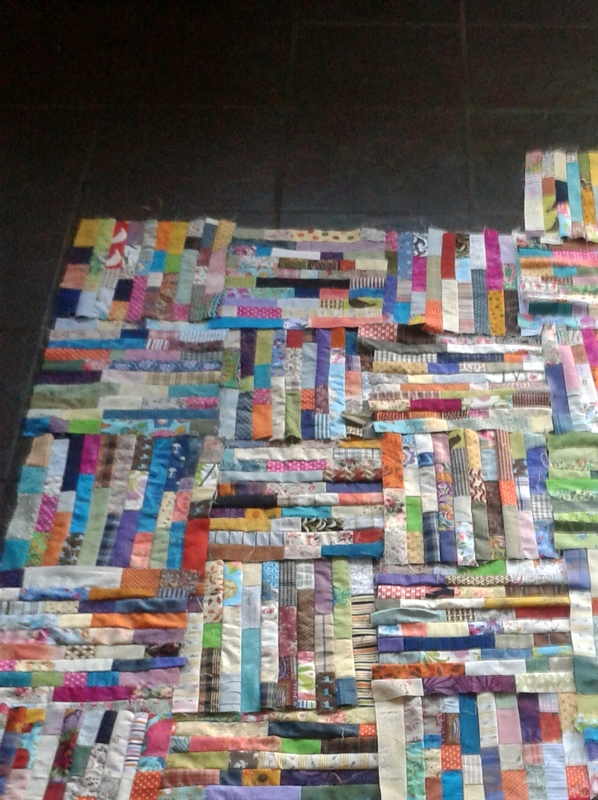 I love scraps - need to get some done on mine which is like yours!! Your dog is gorgeous - do you think his leg pieces are just too small to use?!!! This has me thinking as I have a lot of really small scraps - love the dog! Hahaha - funny Kaja! Love the dog ending to your post. I hadn't ever thought about it, but you are so right about how using scraps teaches us more about the use of color. It seems I can only do improv with scraps. I've never made a cute dog, though! I gave my granddaughters a bag of scraps. They are quite creative with them and are getting very skilled at improv doll clothes making. It's fun to watch them. Ha, love the dog, about died laughing right there and I am so sick from a cold, really perked me up. I find it odd that people won't cut up fabric to use for improve quilts. It is all fabric and if I want to use that color/print I cut up a piece. You have to cut it up for regular quilts or "planned" quilts so why not for improve. I think it is time we give our improve a higher status instead of just to use up scraps. I think "scrappy" sometimes becomes "crappy" in some peoples minds and I think our beautiful works of art need to be on a level with the "others". I find your work and many others work in improve beautiful as well as the more "normal" ones we see.